Our most popular tape - it's magic! It's invisible in use & can be written on. Ideal for paper repairs & sealing. Won't ghost on photocopies or yellow with age. Includes 3 refill rolls of Scotch® Magic Tape 19mm 25m. Pulls off the roll easily, cuts cleanly, resists yellowing & drying out. 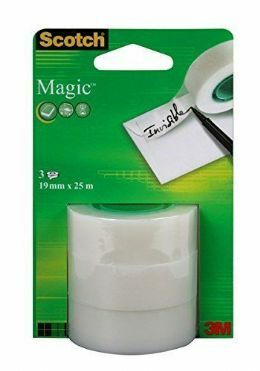 Virtually invisible when applied, this is the essential tape for the office or home - This pack includes 3 refill rolls.